Dairy producers and their nutrition consultants seldom discuss nutritional aspects and possible ramifications of feeding high ash content forages and diets to dairy cows. It is a subject that generally falls off the radar screen because there are numerous and more important nutrients to attend to in ration formulation. Forages and TMRs high in total ash content can skew forage energy estimates and dry matter intake estimates of cows fed high ash content diets can sometimes be misleading. The ramifications of feeding dairy cows diets or forages high ash content are not well understood but excessive ash contents in forages or in dairy cow diets could be a silent antagonist in the dairy nutrition program performance. Ash is simply the total mineral content of a forage or diet. Ash content of a forage or total mixed ration is easy and economical to measure in a forage testing laboratory. In a general, ash content of forage or TMR is determined by a process similar to cremation. The forage or TMR is burned at 500°C for 2 hours and the residual minerals, often called inorganic material, are determined. The laboratory procedure is extremely accurate and precise but it is important to understand that the procedure measures the simple sum of all minerals in the feed. Minerals in feeds can be broken down into two general categories, endogenous and exogenous. Endogenous minerals can be loosely defined as minerals plants normally contain such as calcium, phosphorus, potassium, and magnesium etc. Many endogenous minerals are of nutritional value for lactating dairy cows and we often want the value, such as in the case of calcium to be high to reduce supplementation cost. Exogenous minerals can be defined as minerals that are exterior to normal plant minerals. Exogenous minerals are primarily the minerals associated with soil such as silica and forages and rations should contain as little soil contamination as possible. 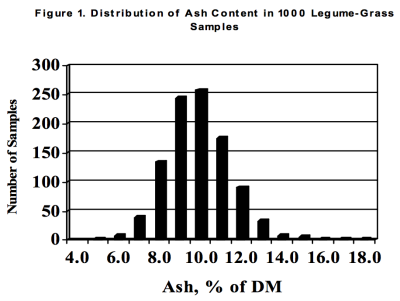 In TMRs a third category of ash, supplemental minerals, is also represented in a total ash measurement. Supplemental premixes, salt and buffers would be the major contributing supplements to this category. The total ash procedure does not however distinguish between endogenous, exogenous or supplemental minerals but as previously stated a sum of all of the minerals in a feed. However if total ash content is known many inferences can be made simply by evaluating the total ash content of a forage or TMR and comparing it to reference values. By nature ash or minerals are devoid of protein, calories, energy or nutrients that a dairy cow can ferment in her rumen. In fact, the reason we measure ash content of forages and TMR’s in forage testing laboratories is to estimate energy and calculate non-fiber carbohydrate content (NFC = 100 − ((NDF-NDFCP) + CP + Fat + Ash)). Because feeding minerals to cows is a common and necessary practice it is important to understand what constitutes a normal ash content in a forage or TMR and what constitutes an abnormal ash content. If the ash content of a forage or TMR is abnormally high there is a very good chance the forage or TMR is contaminated with soil which is not desirable. Listed in Figure 1 is a histogram of 1000 legume-grass silage and hay samples. The normal ash content of legume-grass forages is near 9.0% (DM basis) however we have observed some legume-grass forages which contain up to 18.0% ash. Legume-grass forages containing 10-18% ash are likely contaminated with increasing amounts of soil. soil to his or her cows. Unfortunately the research literature is almost devoid of information to help understand what may happen to cows in this situation so we can only speculate that feeding 2.5 lbs of soil would not have a positive effect on lactation performance. 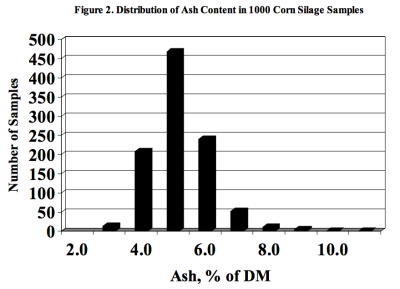 A distribution of common ash contents in corn silage is presented in Figure 2. In general corn silage has less ash as compared to legume-grass forages. The normal ash content of corn silage is approximately 5.0% of DM but we do observe corn silage samples which contain up to 10.0% ash. Again, dairy cows fed corn silage containing excessive ash could be consuming significant amounts of soil as a result. 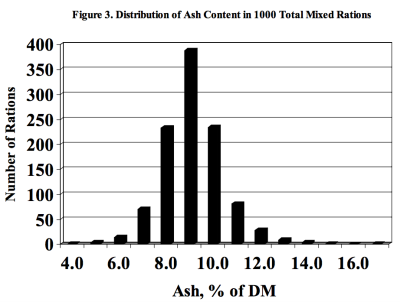 Finally, the ash contents of 1000 TMR’s are listed in Figure 3. The normal ash content in TMR’s is 9.0% of dry matter which includes endogenous minerals, exogenous minerals and supplemental minerals. In extreme situations ash contents of TMR’s have contained up to 17.0% ash. In these situations a lactating dairy cow consuming 55 lbs of dry matter would be consuming a net of 4.4 lbs of excessive soil, mineral supplement or its total equivalent. These examples highlight that the amount of non-fermentable inorganic matter in some dairy cattle diets can get very high. Why are some ash values high? Laboratory observations alone cannot pin-point why ash contents are high in some forages and TMRs. New forage harvesting and storage practices used on many dairy operations may play a role. A short list of possible explanations is as follows. For example new disc-type hay-bines which lift forages with negative air pressure may also draw soil into the forage. Forages that are lodged due to heavy rains and wind maybe more contaminated with unwanted soil. Forages stored in bunkers, piles and silage bags on earthen bases may result in soil contamination in the loading process. Pack tractors and trucks can drag soil into bunkers and silage piles during the filing and packing process. Finally, sand laden manure spread on fields between first and second crop forage harvest may result in the harvesting equipment pulling the dried sand laden manure residue back into the second crop and severely elevate the ash content of the second crop forage. In the case of TMRs these factors combined with excessive mineral, buffer, or salt supplementation may contribute to high diet ash contents. Many of these situations are unavoidable in making forages and managing dairy cattle diets but paying close attention to ash contents in forages and TMRs may yield valuable management insights for future management decisions. Adapted from: Hoffman, P.C., and D. Taysom. How much ash are you feeding your cows. Hoards Dairyman. Volume 149, No. 20. 659.